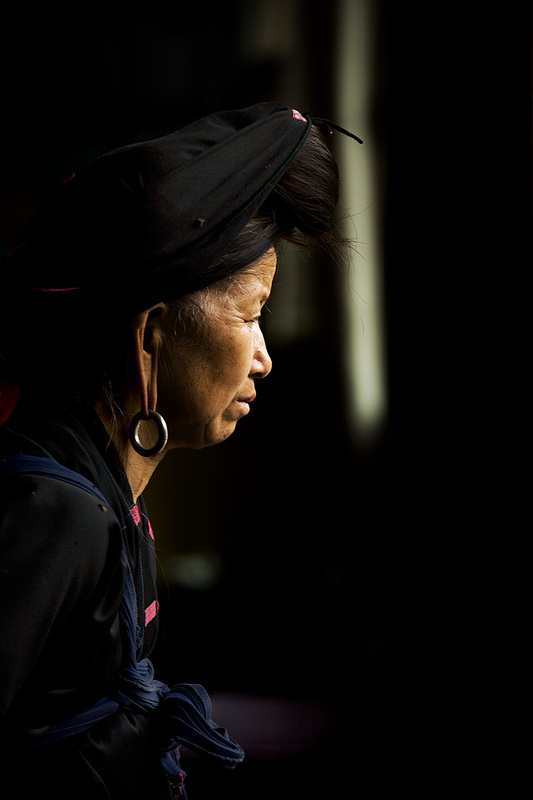 A Miao ethnic minority woman stares out a doorway. This picture was taken at the incredible rice terraces of the Dragon's Backbone (Titian Longji), previously pictured here. Flies or no flies, this woman is still the cutest thing this side of the Yangtze River but not south of the Mekong Delta. The bun above her head conceals year's worth of unshorn hair, typical of the Miao women in this area. 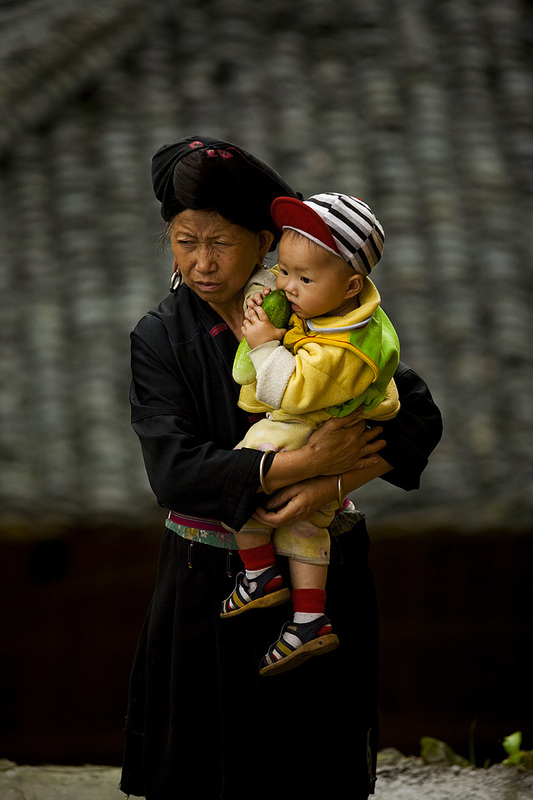 A Miao woman and her grandchild. Not a soul speaks English in this area. My meager knowledge of mandarin allows me to communicate the bare essentials but nothing in the form of meaningful communication. I can ask for boiled dumplings but not "isn't it typically the male's role in the Miao community to raise a child on a day-to-day basis? Why is it you're taking care of this little one?" That's without even beginning to touch on my curiosity about her earrings. So as you can see, I don't have many more explanations for you about these people except what I observed first-hand. 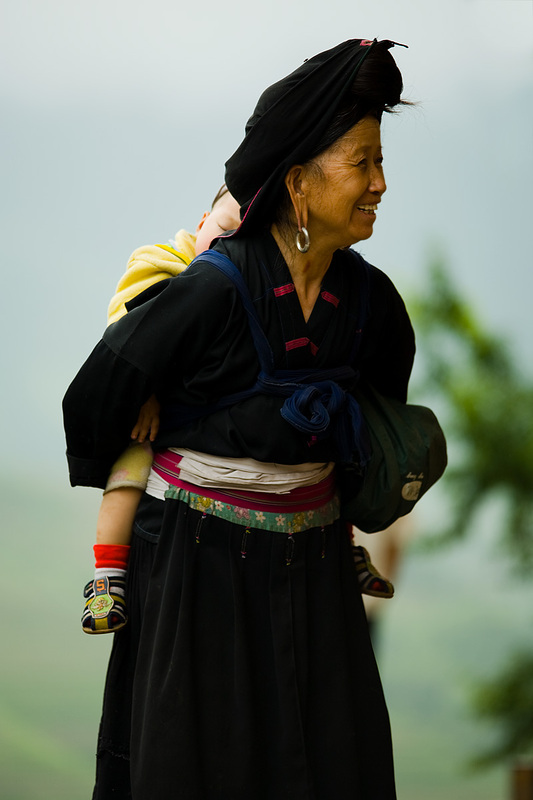 A Miao minority woman chats with her friends as her grandchild naps on her back. Those earlobes are magnificent! The fact that in this age, traditional people are able to carry on their customs despite the onslaught of modernism, is beyond me. However, I noticed the children in the area opting for Chinese style track suits and other fashions typical of the rest of China. Like ethnic people in other parts of the world, their traditions are slowly petering out. Hurry and see the world or else you'll miss the best bits. The first one is really a beautiful picture ! Woman in dark, and in the dark, And the dark accentuates the side view. Nice ! Thanks Tristan! I checked out your site and you've got some great photos. I've got it bookmarked so I can look when I get to a faster connection (when I get out of India).